It seems spammers are trying everything they can think to get more expose, not just simply using a website. They are using media as well. The screenshot above shows a YouTube videos referrers, on top of that, in that blue box, its a screenshot from this blogs referrers. The YouTube video link links to that video, which is about casino. From YouTube stats, you can see there were 4+23=27 visitors from blogger.com, I believe they are all targeted Blogger bloggers. 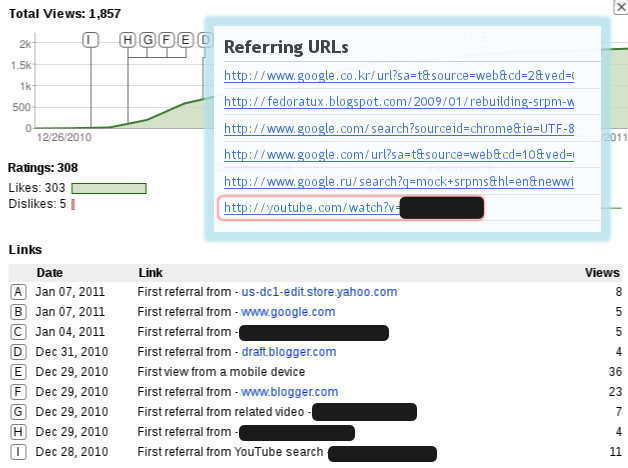 When I first saw that referrer in Stats tab of dashboard, 99.999% I was sure its faked since no way anyone would link my blog in their videos descriptions or comments. But I still clicked on it to check it out. You can also see it has 303 likes and I bet they are all faked, too, but those 5 dislikes, I am certain that they are real ratings. I was thinking to flag that video, but I couldnt. There is no suitable option to file an complaint, it makes sense. Someone might use this to attack normal video, in other words, we have to take this kind of spamming. Too bad, there is no Spam folder as in Gmail. Spam will be a thing of the past in two years time. Bill Gates. I really wish he was right. That was in 2004. Six years later, they are still around. Currently, if you dont see, they are just being hidden by algorithm. They are detected and put into spam folder. Thats sad, because what needs to be done is to find who sends not to write some sophisticated program to detect, those companies fight back in wrong direction. They keep saying how many they have done. The truth is they dont, they just cover our eyes. Collecting evidence and help to charge those spams. Say one spam mail for just one minute community service, that would definitely be enough.